private menageries, and fenced parks dot the crowded cityscape, making Caliphas feel more alive than many Ustalavic cities—which often seem better suited as tombs for dead princes. The past decades have brought thousands of immigrants to the capital. While the nobleborn find and create luxurious housing with ease, their attendants have considerably more trouble. Such has led to not just overcrowding, increased squalor, and street violence in parts of the city, but to stranger crimes against which the overwhelmed constabulary has little defense, such as kidnapping, hidden slavery, underground fighting bouts, mysterious murders, and rumors of terrors lurking amid the city’s labyrinthine sewers. a part of the city as its crowded streets, steeplelike spires, and treacherous nobility, Caliphas is a city that promises grandeur, but only for a select few. For those without the titles, talent, or wealth to win the city’s fickle affections, Caliphas remains a labyrinth of crime, corruption, disease, exploitation, and horrifying secrets, where lives are cheap and the unwary are all too often swallowed by the fog, never to be seen again. In 4727 the rule of Prince Aduard Ordranti III was cut short by an untimely, but presumed natural, death. The long-since predicted heir to the throne, Reneis Ordranti, ascended to the position of Prince after decades of politicking by his aunt Countess Caliphvaso. Since Reneis ascension to the throne, Caliphas has maintained a semblance of stability and order in otherwise chaotic and unpredictable times. 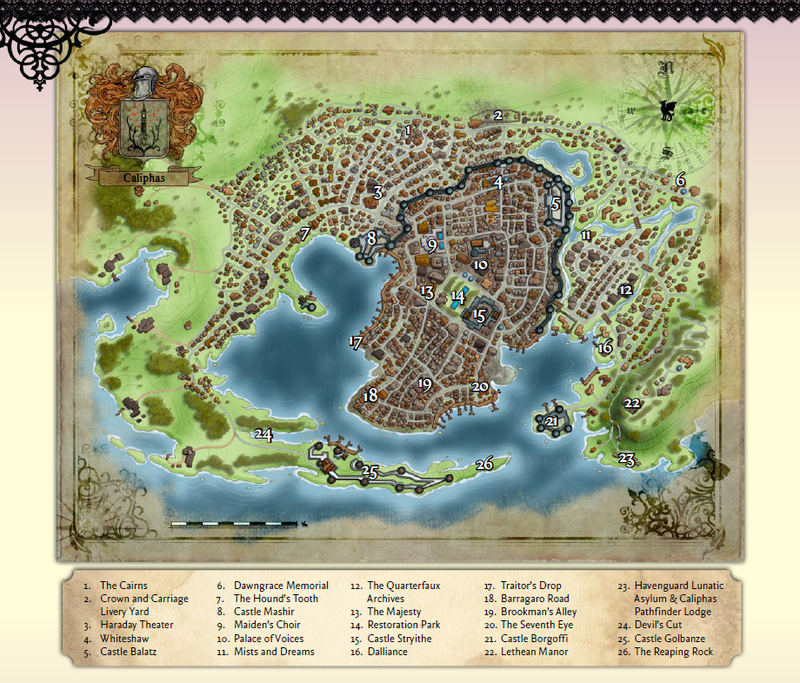 Seven districts divide the city of Caliphas: Ashtown, Blackwood, North Cushing, West Cushing, Dowell, Eskcourt, Hawthorne Rows, Laurelight Hill, Leland, and Valpole, each made distinct by its geography, population, or trade. Just beyond the city lie several boroughs that support it, the best known being Crossleigh, where many of Ustalav’s finest ships are built and harbor; Wrenhyde, the garden country where many of Caliphas’s elite keep their manors; and Graystove, where coal and the lives of peasants fuel the constant production of brass, bronze, and great works in metal. sham soothsayers read fortunes in dice and bones, Sczarni dancers distract easy marks, and several of the city’s dealers in magical goods—of both dubious and masterful quality—keep shop. The flower seller Madam Camille (N female human expert 4) and her remarkable hallmark hats are among Barragaro’s most venerable fixtures; the rosycheeked matron possesses an uncanny memory for who’s selling what and who shops where. Yarri and Yevette, who were mysteriously slain while playing, while others maintain there is but one ghost, the ghost of a Kellid boy stoned to death by the same girls. associated with the strictly outlawed shamanistic Kellid faiths of old. The noseless crone Brynran Khoraseid (CN female human oracle 7), the oldest resident of the Cairns, is regarded as grandmother and leader by much of Caliphas’s impoverished Kellid population. Traders and travelers across Ustalav and beyond curse the name Balatz, Caliphas’s main trade gate. All merchants and newcomers to the city must enter through the fanglike portcullises of the fortress, where taxes are levied and travelers are documented. Although the members of the city constabulary who guard the gate are susceptible to taking bribes, the gazes of the military patrols minding the castle walls often deter even the greediest guards. Balatz also holds the offices of General Drannon Ulvodos (LE male human cavalier 8/noble 2), head of the Ustalavic army, and of his support staff. While the aging general has never seen battle—his father having won him the title in a decades-old political machination—he seeks every opportunity to indulge his power, constantly counseling the prince to warlike ends. While Castle Golbanze is Caliphas’s shield against threats from the sea, Borgoffi is the city’s rusting sword. Bristling with ballistae and mangonels, the fortress boasts a vast arsenal of deadly projectiles, including hull-perforating spears, alchemist’s fire bombs, and casks of quicklime. The castle’s eccentric master of arms, Ritambros Deymarian (N male human alchemist 4), also experiments in the development of new weapons of war, and has been known to pay for such strange materials as molds from the Darklands, undead body parts, and diseased rats to employ in the creation of his prototype arms and ammunitions. Yet for all of its armaments, Borgoffi sees little action outside of regularly scheduled exercises. Colonel Joelm Colmar (N male human fighter 5), the commanding officer of the fortress, resents his position, seeing the post as a boring career cul-de-sac. On most days, he entertains himself by tending to his two dozen pet ravens, kept in an expansive coop on the castle’s roof. Gaspair (LE male human bard 5); and the largest vessel in the f leet, the Indomitable, commanded by Captain Leos Tailor (LG male human cavalier 8). Gateless Tower is the fort’s prison, its squat shape and thick walls housing Caliphas’s most dangerous prisoners. safety, Morstenni holds the respect of her officers and regulars on the city’s docks, her charm and good looks easing the sting of the citations and fines typically left in her wake. Peers that make up Ustalav’s fractious congress of counts, the Gallery of Ancestors portrait hall, and numerous meeting chambers, treasuries, libraries, rooms for visiting ambassadors, and other luxuries of the nation’s rulers. 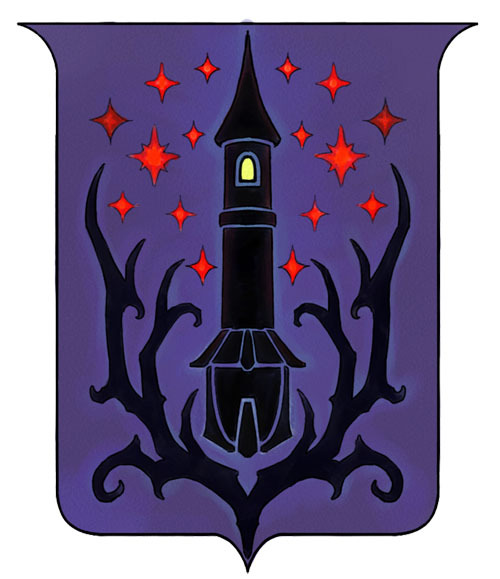 Yet some claim that the castle wasn’t built for the princes of Ustalav alone, but also for those who would oppose them, with secret chambers, arsenals, traps, and passages lurking throughout the castle, as well as a secret command center capable of turning the entire palace into a deathtrap with the flip of a lever. When word of the royal court’s relocation reached her, Countess Caliphvaso ordered and personally oversaw the construction of Stryithe, a castle of elegant stained glass, daring flourishes, and crimson stone. Now completed, the imposing, spire-crowned citadel rises from the city’s center like a bladed, fiendish heart trapped amid a web of mounting buttresses. Home to the audience hall and black-antlered royal throne of Prince Ordranti, the echoing Hall of Peers with its 16 traditional stations, the portrait hall known as the Gallery of Ancestors, the royal archives, a private wing for visiting dignitaries, and a maze of shadowed alcoves, conference chambers, and salons, Servants also spread rumors of myriad secrets, both predictable—like hidden floors, shifting passages, and escape routes—and sinister, such as shafts to unknown oubliettes, stores of treacherously hidden poison, and construction plans that suggest blasphemous agendas. steeds for sale—including the fell ponies popular among riders of many of the nation’s rockier counties. must be placed months in advance, and while the prices prove as extravagant as the mysterious multiple-course meals, the house’s lavish amenities—like private dining rooms, skilled musicians, individual wait staff, and personal food tasters—make the experience well worth the cost. bureaucratic quagmire aggravated by the abbey’s current owner, Countess Caliphvaso. Although the Reaping Rock creates an ideal natural harbor, it’s not without its drawbacks. Much of the filth that slips into Caliphas harbor, be it runoff from industry, drainage from the city sewer, sediment washing along the coastline, or other refuse, becomes trapped within the cove. While a significant amount sinks to the bottom, that which f loats upon the black water eventually finds its way to the Devil’s Cut, a filthy quagmire of trash and pollution almost thick enough to walk upon. Scavengers, both animal and human, frequently pick over what washes up in the constantly churning muck, the occasional lost treasure or unlooted body rewarding those with the stomach to face the wretched smell. But some unfortunates tell of tarry things that slip beneath the surface of the muck and drag down any who would steal their reeking treasure. A most unusual hospital spreads its batlike wings across the crumbling cliffs overlooking Caliphas. Here doctors seek to see past legends of fiendish possessions and cursed blood to treat unfortunates suffering from ailments of the mind. Under the direction of its founder, the dedicated but locally slandered Dr. Beaurigmand Trice (NG male bard 10), the asylum’s physicians attempt to protect, understand, and heal without the aid of expensive magical interventions—though many admit incomplete understanding of the maladies they treat, or missteps in their more experimental therapies. hedonistic entertainment amid impressions of scandalous innuendoes and constant observation, but little else. Dr. Trice firmly believes that humans hold the power within themselves to help one another. To this end, he has pursued a life as a healer, yet he forgoes reliance on divine magic. Through a lengthy career, his interests have come to focus on maladies of the mind, the study and healing of which brought him to construct Havenguard Lunatic Asylum. Many in Caliphas misunderstand Dr. Trice’s intentions and unconventional treatments, viewing the asylum as a prison or house of horrors. Yet the good doctor has been able to help untold numbers of unfortunates, and for those whom he can’t aid medically, Trice relies upon his position as a Pathfinder venture-captain to find others capable of offering assistance. To this end, he maintains Ustalav’s largest Pathfinder lodge on his hospice’s grounds. With the asylum’s seemingly endless number of patients, Trice has come to rely more and more on his assistant Cereis Linas (N female sorcerer 6), especially in regard to the fascinating but frightening case of Mr. Tembs (CE male witch 10), a confessed but unconfirmed murderer with at least three deadly personalities. Packed every night with craftsmen, stevedores, and others of the city’s working class, the Hound’s Tooth offers little in the way of atmosphere or food, but the drinks are cheap and only lightly watered, which is enough to keep the crowd happy. A former constable, barkeeper Shaid Boxmon (NG male human ranger 3) lives above the tavern with his wife, Fhanna, and two teenage sons, Quinn and Shaid, Jr. Protective of his family and those he deems worth the effort, Shaid knows more about the dark side of Caliphas than he is comfortable sharing, and has been known to violently expel patrons from his bar merely for giving him a bad feeling. countess’s attentions. These fetes are typically of such decadence that participants regularly cannot remember the festivities—or go missing altogether. three are ever rented, as the owner, Orenthal Rightier (LN male human expert 7), refuses to ever let Room 404. A gigantic dome of amethyst-veined black marble stares unblinkingly heavenward from Caliphas’s temple of Pharasma like some vast empty socket. At the chapel’s heart stands a silver, mausoleumlike reliquary said to bear such holy treasures as the Sarkorin song skulls, the scroll bones of Father Gesenge, the armored Gown of Tears, and—or so high priestess Mother Verith Thestia (NG female cleric 12) claims—one of the steel splinterfeathers of the goddess’s own herald. The royal church of Pharasma counts most of the city’s pious among its congregation. Mother Thestia presides over the ancient and impressively domed structure, which has existed in some form since even before the reign of the Whispering Tyrant. Some whisper that a horrifying remnant of the lich lord’s rule still lies locked away in the temple’s catacombs, but both Mother Thestia and Zetiah Mardhalas (LN female inquisitor 6), the cathedral’s merciless exorcist, deny such claims. body of an overlarge blacksnake, and Seleis “Tidadimara” Savoisi was born in Magnimar, not Bannaquet as she claims (and which she mispronounces as “Bana-quaint”). The true business of Mists and Dreams takes place in its cellars, where Tidadimara runs a pesh den selling the concoctions of the mysterious Dr. Low. The royal theater and opera, the Palace of Voices stands as the pinnacle of society and entertainment for the Ustalavic elite. Brother and sister Paulo (NE male human bard 4) and Marrian Carameizta (CE female human rogue 5) own the theater, having jointly inherited it from their deceased parents. Although both love the stage and the storm of society and prestige that surrounds it, they loathe one another and have diametrically opposed philosophies on how to run the centuries-old opera. While the owners nurse childhood grudges and petty rivalries, the staff and stage company look to conductor Aldentor Rudono (N male bard 9) for leadership. Rudono is an aging musical genius who leads the theater to riveting season after season, while keeping up a love-hate relationship with Headmistress Calmadra Vhalikackos of the Karcau Opera. XIV discovered by Osiriontologist Abraun Chalest, and the temporary display of the Moulot Family’s Thassilonian treasure, the Invidian Eye. typically only those of noble lineage whose families have made significant donations to the museum, but even then there are still certain works and artifacts that can only be viewed with the written permission of the museum’s head curator, Regan Saramul (LN female bard 7). deaths within sight of a safe harbor. The broken hulls of dozens of ships lie strewn along the length of the Rock, the most infamous being the wreck of the Silver Star, crashed by a heartbroken navigator, and the Trackless, a vessel lost 40 years ago that reappeared during a storm in 4710 ar and wrecked upon the cliff, with no signs of the crew ever found. Incongruously situated amid several warehouses near the city’s eastern docks, this strange restaurant keeps unpredictable hours. The Seventh Eye only opens when its owner, the mysterious Dr. Low (LE male human sorcerer 10), wishes it. Few beyond his network of agents have ever met Dr. Low face to face, but reports invariably describe him as an unfailingly polite and wellcultured man of obvious Tian descent, with some honoring him as a mystic and genius, while others curse him as a criminal and sadist. For years, the city constabulary has sought to pin charges of kidnapping, smuggling, slavery, illegal magic, murder, and other crimes on the imperturbable foreigner, only to have their leads evaporate or witnesses vanish at the last moment. Cluttered with debris and harbor trash, this out of use slipway serves as the traditional disposal site for beaten or murdered traitors and deserters. Locals—especially sailors and stevedores—regard being left in the filthy brine of the Drop as a particularly disgraceful end, making it a popular place to ditch the dead or half-dead. The establishment of a constabulary post nearby has not decreased the Drop’s use, and constables on watch frequently marvel over bodies discovered in the morning despite no one having been observed approaching the slipway all night. agency exists outside Hoptler’s command, instead reporting directly to the prince’s advisor, Diauden (LN male human rogue 10).